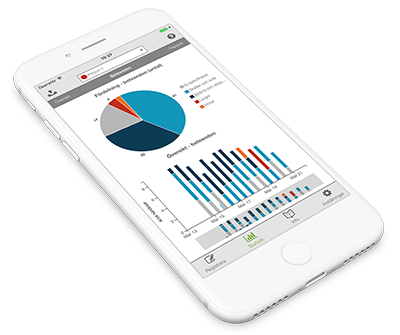 “Behaviour of concern” is an app for iPhone, iPad and Android in which you can keep track of behaviours of concern and observe trends and patterns. The app makes it easier to draw conclusions about the behavioural patterns of violent outbursts and conflicts and contains information on how to handle different situations. The app was developed in collaboration with psychologists who have long experience of using the low arousal approach and working with persons displaying behaviours of concern. The Swedish National Board of Health and Welfare recommends the low arousal approach in the treatment of people with inadequate affect regulation, in order to, in the moment, prevent or reduce behaviours of concern. This may involve, for example, people with autism spectrum disorders and ADHD. It can also involve children who are developing, and in their attempts towards independence have difficulties with affect regulation. The app can be used by professionals or parents who need help to see patterns in everyday life and by doing that try to create changes that reduce unwanted behaviours and increase positive interactions. This is a tool that facilitates tracking of severe behaviours of concern and outbursts that disrupt daily life. Warning behaviours, which are a bit lower in their level of arousal, but still signal that everything is not going smooth, may also be tracked using the app. After a period of use, it will be possible to see if there are days or times of the day where outbreaks and chaos are recurring. If you make changes in everyday routines or in response to a conflict situation, you can, after some time, find out if the changes have had an effect on the amount of outbursts. By using the tool, working proactively and managing behaviours of concern using the low arousal approach, we can avoid serious conflicts and dangerous restraints. The low arousal approach is a method that protects the right of children and functionally-challenged individuals not to be subjected to practices that are dangerous or that can be perceived as offensive. If you want to learn more about how to understand and deal with behaviours of concern, you can read the literature by among others, psychologist Bo Hejlskov Elvén, about the low arousal approach and behaviour of concern. The founders of the website “Pedagogiskt kapital”, Daniel Elvén and Carita-Li Smyth, together with other psychologists, want to provide different perspectives on how we can solve problems in a way that increases people’s experience of participation and security. IMPORTANT: Handle collected data with care since it can contain personal information. The app is a way to track when behaviours of concern arise. Every half hour you note down mood changes in the app. The affect level is preset to “everyday”, so you only register severe, behaviours of concern and warning behaviours. Behaviours that create serious conflicts and interferes with daily living, with an average of around 1-4 times a day are marked with red. The behaviour has such a powerful emotional strength that it is not possible to talk about the problem or solve it in the moment. Register the behaviour by pushing the affect bar upwards until it becomes red. Behaviours that are less powerful in emotional strength, than the red bars, are called warning behaviours. They signal an increased pressure. The emotional strength of the warning behaviour is of a magnitude, that if we try to solve the problem by talking about it, we risk increasing the pressure and emotional strength further. At the level of warning behaviours, low arousal methods can be used to mitigate emotional strength, so we can avoid more severe behaviours of concern. Learn to recognize the warning behaviours and code them with the yellow bars. What does the statistics mean? The statistics show patterns or trends in the person’s behaviours of concern, over time. It allows us to analyze and identify situations that increase the person’s stress level and find possible explanations for fluctuations in the person’s mood. A lot of yellow bars can imply that the expectations and demands on the person are too high. The statistics gives the information that there might be a need to evaluate if the assessment and handling of the person’s maturity and level of functioning is correct. Such information is important because, among other things, the person’s own experience of its own capabilities to meet the demands of the surroundings, is connected to the level of experienced stress. The longer period you register a person’s behaviour in the app, the more confident you can be that it is not a matter of chance, but a recurring pattern. A longer period of use increases the possibility to predict situations where the person is liable to lose his temper. We recommend that you register the behaviour for at least two weeks. Then you should evaluate the behaviours you have chosen to examine. Are the behaviours still a problem? And do you get an idea of the extent? Then proceed to use the app at least two weeks more, before it is time for the next evaluation. If needed, redefine and/or specify the chosen behaviour in a way that makes it more relevant to work with and easier to identify. If we want to work with action plans to better be able to handle behaviours of concern, it’s also possible to use the app for before and after measurements. Everyday life flows, the person is calm and behave as expected / usual. The green behaviour differs between individuals but is the expected behaviour in terms of that particular person’s maturity and level of functioning. You can say that green behaviour is the most anticipated behaviours, when conditions are good. Warning behaviours suggests that the person feels stressed. What constitutes yellow warning behaviours are related to the behaviour defined as green. Yellow warning behaviours are always more powerful than green and more unexpected than the behaviours that characterize normal state. Yellow warning behaviours may include physical anxiety, incoherent language, irritability, light self-harming behaviour, confusion, hangups or loss of specific skills that the person otherwise have under “green conditions.” Warning behaviours can also be quite different than those behaviours mentioned above. Study and observe what kinds of yellow behaviour you see. When a person exhibits “yellow warning behaviours”, you should reduce and / or adapt demands. Give the person space and when needed extra support. Divert if possible. The stress level is high and the person exhibits powerful and severe behaviours that interfere with everyday life. The red behaviour is behaviour that creates major problems for the person and for his/her surroundings, and is the behaviour we want to understand and work with. What constitutes a severe behaviour of concern is related to what behaviours are acceptable warning behaviours. It could, for example, involve violent outbursts of anger or physical violence against themselves or others. What constitutes red behaviours of concern are individual and can vary over time. Red behaviours are always severe and the behaviour that is most powerful in affect strength. When a person needs help to lower their stress level, we minimize demands, provides space and make sure that no other people are nearby who risk getting injured. Speak calmly and don’t block any escape routes. Avoid physical contact. If you have questions regarding the app you can get in touch with Carita-Li Smyth, Daniel Elvén and Christian Bergbom at the site behaviourofconcern.com/contact/. To learn more about the Low arousal approach and behaviours of concern, visit Bo Hejlskov Elvén’s website – eng.hejlskov.se. There’s also www.lowarousal.com for further information and resources about the low arousal approach.